What's the Difference Between the HubSpot CMS and a Traditional CMS? We're often asked the question, where should I build my website? Should I use the HubSpot CMS or a traditional CMS, such as WordPress? It's an important decision to make when websites are generally redesigned every 24 months and are the hub of all your digital marketing efforts. We're broke down the key differences and decision points between the HubSpot CMS and a traditional CMS. For the purposes of this post, we used WordPress as it's generally the other tool in the running, and its differences from the HubSpot CMS are very similar to Joomla or Drupal so the same principles apply. CMS stands for Content Management System. These systems brought a major shift in web marketing since they allowed non-developers to generate and publish content. There are many CMS platforms available today, among the most popular are WordPress, Joomla, and Drupal. Of the three, WordPress is the most widely used open source CMS, and is both mature (released thirteen years ago) and robust with numerous plugins to accomplish nearly any purpose. HubSpot released their CMS just under three years ago and it differs from a traditional CMS in two key ways. First, it's a holistic platform, which includes website pages, landing pages, blog forms, email and analytics all-in-one. Second, it offers a full integration with HubSpot's Marketing Hub, which allows it to sit on top of your marketing database and create more personalized relevant experiences for your visitors. Now, let's dive into why (or if) these differences should be important to you and your business. There is more grey area on the last one, as this limitation is a common CMS misconception because this functionality can be implemented in HubSpot. Though depending on the use case, WordPress may still be the better choice. ...but the HubSpot CMS is BETTER! When it comes to building a website built for lead generation, it's clear that HubSpot is the best choice. There are two primary reasons I feel this way. Most importantly, HubSpot allows you to tie the entire customer lifecycle together, from a top-of-funnel website visitor down to a bottom-of-funnel closed-won customer. Being able to tie attribution throughout this process all within the same platform is incredibly powerful for data-driven marketing. The HubSpot CMS is an invaluable tool for content personalization as you're able to segment all of your marketing data and digital body language to create relevant and personalized experiences for your site visitors. This can be done using any contact property, custom event or even referral source or device type. It's incredibly powerful and will be one way that the best marketers differentiate themselves and their brands this year. Smart CTAs: HubSpot allows for dynamic CTAs that can change based on previous user activity. For instance, if a site visitor downloaded an e-book that is an overview in using social media in marketing then they might also be interested in an e-book on using Twitter in the B2B space. Smart CTAs will dynamically change the CTA to download a Twitter e-book on that particular user’s next visit. Smart content: To go a step further, the HubSpot CMS actually allows us to have custom, on-page content for specific buyer personas. If we already know that a prospect is interested in web design, we can push that type of content right on the homepage. Even better is that we can do the same with email campaigns. We can make certain sections of the email “smart” and segment our contact lists so that people get content that’s directly relevant to them. 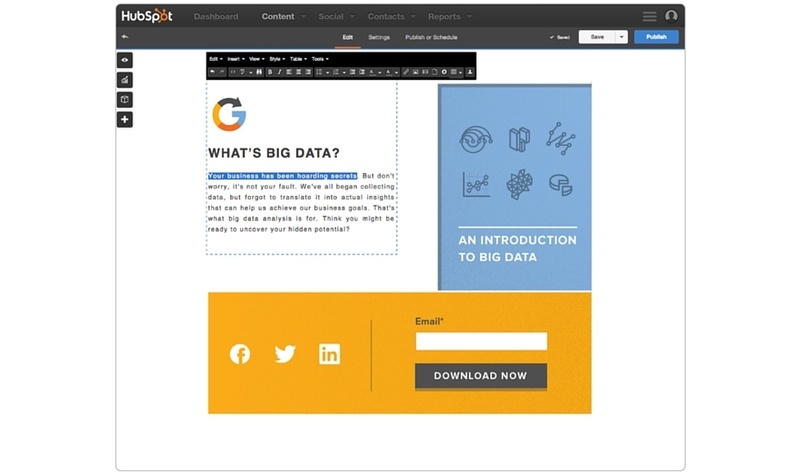 Smart forms: Are another “smart” feature of the HubSpot CMS. Not only do these forms remember a user's information so that it doesn’t need to be retyped (allowing for higher conversion rates) but it also allows us to gather more information about a specific lead over time. The first time they fill out a form we might ask them for the most basic information (name, email, and title). The next time we may ask them the size of their company, what market they are in, or even a specific marketing challenge. The community: The HubSpot community is one of the best we’ve ever experienced in the marketing universe. It’s full of people who honestly love marketing and are eager to exchange knowledge and learn together. This is seen from their support team to the inbound.org community. The marketplace: Along with the new CMS is the HubSpot marketplace. Here you can purchase templates, find inbound marketing firms to help you carry out campaigns, and even purchase apps to extend the capabilities of HubSpot. New features: As a HubSpot user, you’ll also get access to new features as they roll out without additional costs. It's been amazing to see how fast HubSpot is moving to iterate on a platform that's only existed for three years. And the fact that it can already compete with WordPress (which has been around for over thirteen years) is crazy! The biggest takeaway here is that WordPress is great and is a good option for use cases such as e-commerce, personal blogs, internal wikis and enterprise sites with complex database functionality. However, for B2B marketers with lead generation goals, HubSpot is hands-down the way to go. From ease of use and full-funnel integration to content personalization, there's no doubt that it will serve you and your website well.